Front exterior of the Telesis House. Photo: Joe Fletcher. 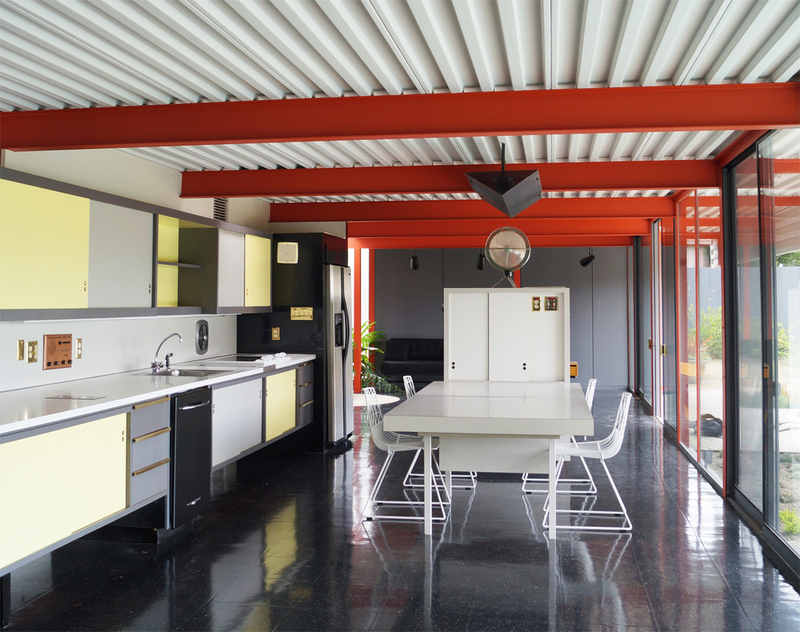 Inside and out of the Eichler X-100. Photos: Scott Martin (top), JC Miller (above). Hillmer only built about a dozen homes, yet still was dubbed "one of the most original architects produced by California" by architectural historian Alan Hess. He rose to Munger's challenge in characteristically creative fashion by designing an innovative, hexagonal spiral floor plan of 24-inch materials angled at 120 degrees, with nary a 90-degree angle in the place. Among the restoration challenges for Robbins and Lambert was finding a source of unfinished, old-growth redwood, one of only four building materials used on the house along with stainless steel, concrete, and glass. Still another was reviving the radiant heating system, which needed some rerouting and a new boiler. 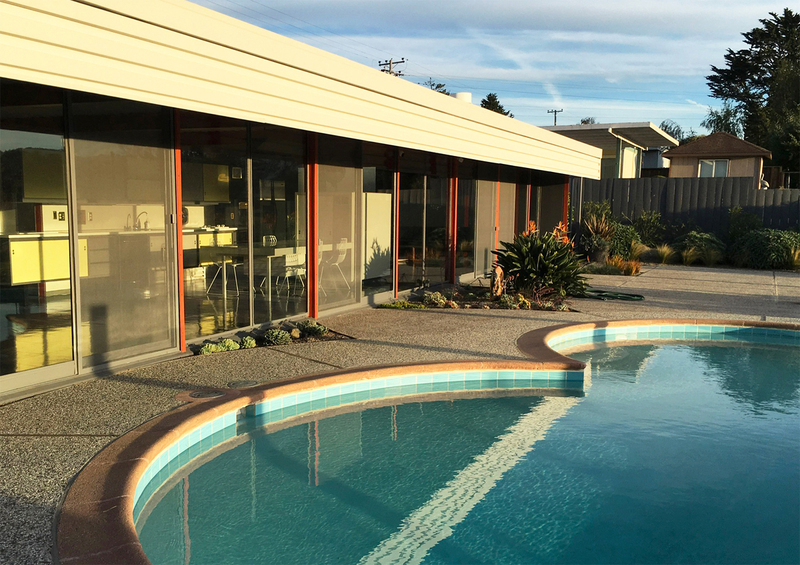 Marty Arbunich, publisher of the Eichler Network and CA-Modern magazine, worked with an equally innovative but more complete home when he assumed ownership of the X-100 in 2013 after a decade of co-ownership. Still, the restoration that followed cost several hundred thousand dollars and included its own challenges, such as matching the hue of a damaged large aggregate deck around the swimming pool. "They were right," Arbunich said with relief about the pouring of a new deck for the X-100 by Peninsula Concrete, who assured him the aggregate pebbles would mellow into matching the original reddish-brown tone. "In the end, despite our trepidation at the front end, it was a near-perfect replication, I'm happy to say." The X-100's restoration, which was headed by Lucile Glessner Design, landscape architect JC Miller of Vallier Design Associates, and general contractor Smollen the Builder, also included removing the garage door, thus restoring the original carport; removing metal cladding over the original wood siding; adding custom gates that reflect the house's circular motifs; reinstalling an original side-yard fence and landscape themes of the original landscape architect, Doug Baylis; restoring the pool; replacing 13 spotlights on the roof; and adding new fencing, paint, fireplace, and landscaping. The X-100, which has two bedrooms, two baths, radiant heating, and a pool on 2,190 square feet, will be available for rent as early as August 1. It comes furnished with MCM furniture and art. Its rental is facilitated by Highlands realtor Glenn Sennett. 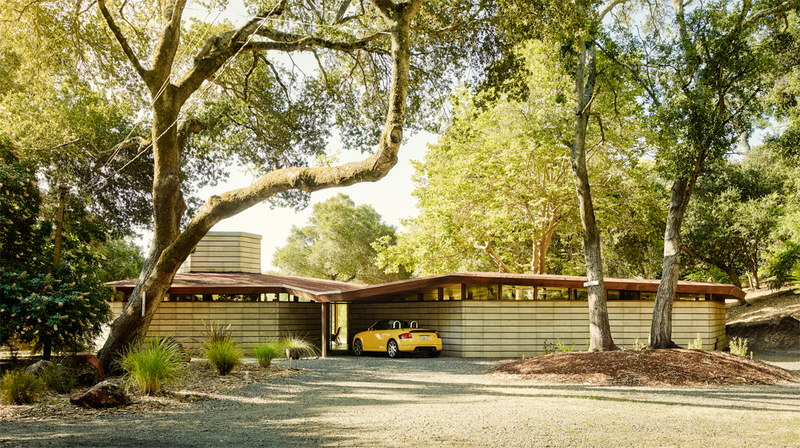 "We're looking for that right someone—preferably a real fan of the X-100," says Arbunich, "who can carry on as guardian while enjoying the home's natural beauty, the fruits of our two years of restoration, and the X-100's unique place in Eichler history." For more information about renting the X-100, click here. For information on the Telesis House, click here.